It was the question on all our minds after disembarking the ferry from Playa del Carmen, surviving a gauntlet of touts trying to rent us cars and scooters, and reaching the end of a shop-lined pedestrian street in the heart of San Miguel de Cozumel. Under the intense mid-day sun, Will and Renae were looking for a quick answer, but I didn't have one. 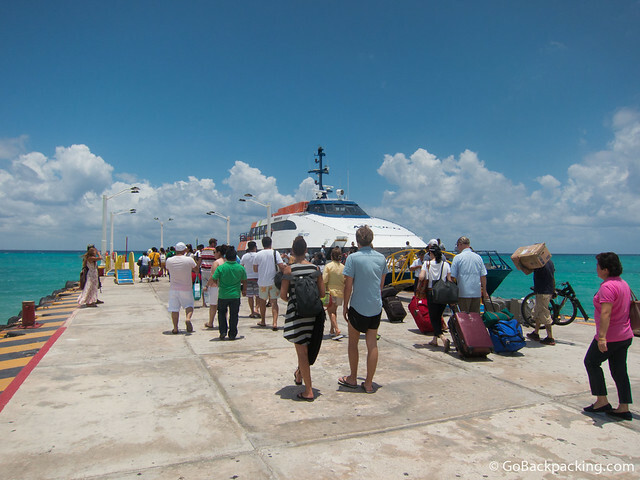 Getting us to Cozumel was the easy party, requiring only that we pay $25 for a roundtrip ferry ticket at Playa de Carmen's little port. Where to go once we arrived? That was the real challenge for the lackadaisical traveler. 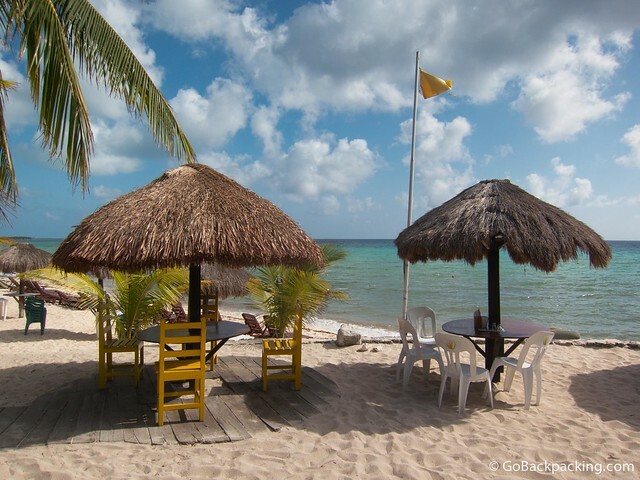 Located a mere six miles off the coast of Mexico, Cozumel's small size, and turquoise waters have been attracting divers, cruise ship passengers, and Spring Breakers for years. Taking a day trip to Cozumel was my idea, yet I hadn't found much information for independent travelers online. I figured we'd arrive and the answers would magically present themselves. They didn't. We approached a nearby taxi, and asked about our beach options. He said there were only a few public beaches on the island, and recommended Playa Palancar on the southwestern edge of Cozumel. It was about a 20-minute drive, and would cost us each about $5 (or $15 total, one way). Upon arrival, we asked our driver to wait while we scoped out the beach. It was perfect, so we paid him and took shade under one of the thatched umbrellas. The beach may have been public, but there's an expectation you'll spend some money on drinks at least, if not food too. We hadn't eaten lunch by this point, so it wasn't a tough sell. I ordered the (three) chicken tacos, fresh coconut water (served in the coconut), and at least one other drink. Including tip, the total came to $18. They only accept cash, so come prepared. Beers including Corona and Modelo cost $2.30 apiece, which still isn't bad by Western standards. A pina colada and most other mixed drinks will run you double that, or $5.45. After lunch, we all went for a swim. The water was a little murky right along the beach, but we were told it can be crystal clear on a good day. 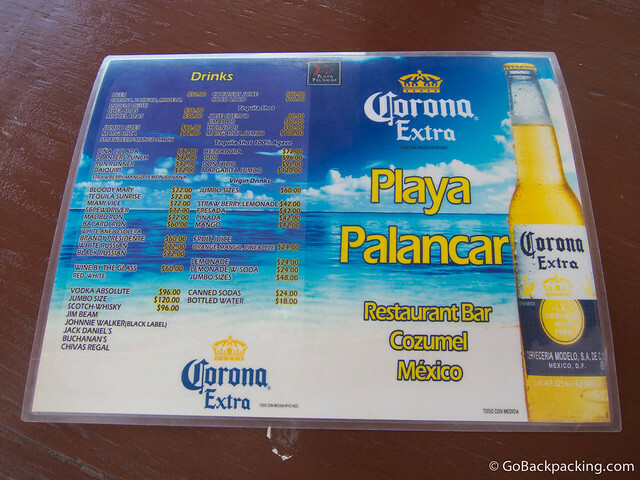 We'd gotten a late start to the day in Playa del Carmen, so by the time we'd eaten lunch and taken a quick dip, the staff at Playa Palancar were beginning to close up shop. 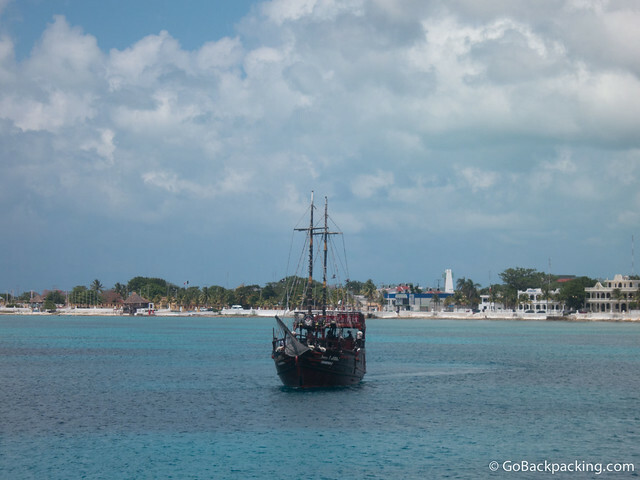 A few taxi drivers had been camped out in the parking lot, so we were quickly able to get a ride back to the island's main city, San Miguel de Cozumel. As we closed in on the pier in San Miguel, I asked the driver if there was a good place to grab a drink and watch the sunset. He dropped us off at one of several thatched-roof beach bars facing west toward Mexico. We had the place to ourselves, and the staff even allowed me to plug in my iPhone so we could listen to some Bob Marley. 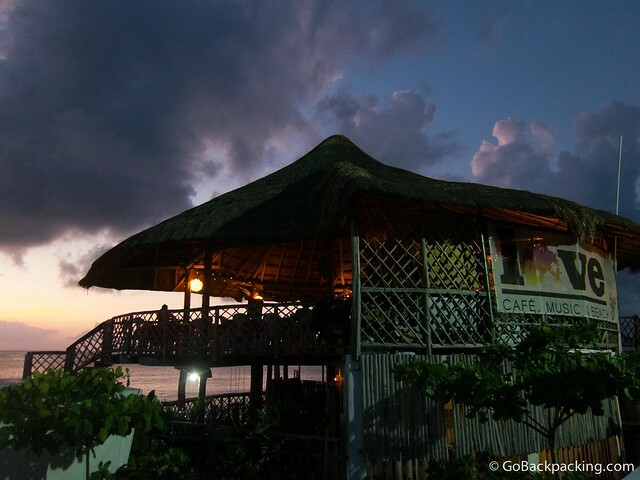 One of the night things about Mexico's Pacific coast, and beach towns like Sayulita and San Pancho, is the ability to watch beautiful sunsets over the Pacific Ocean on a nightly basis. If you're doing a day trip to Cozumel, I highly recommend sticking around long enough to catch the sunset. Once the sun faded below the horizon, we began walking along the boardwalk back to the pier. 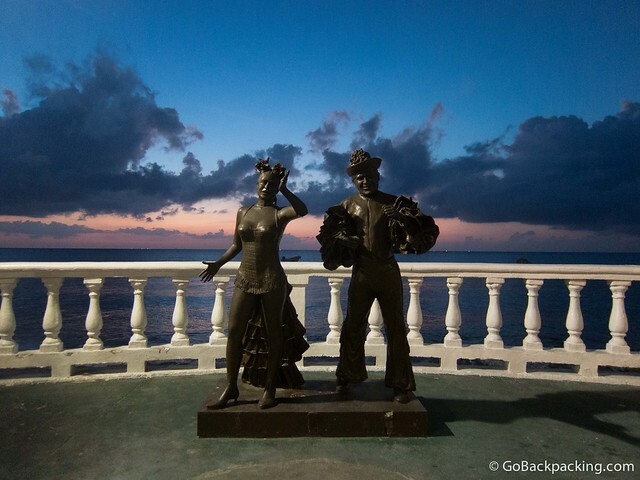 Along the way, there are a series of interesting statutes, which appear all the more dramatic against a colorful sky. 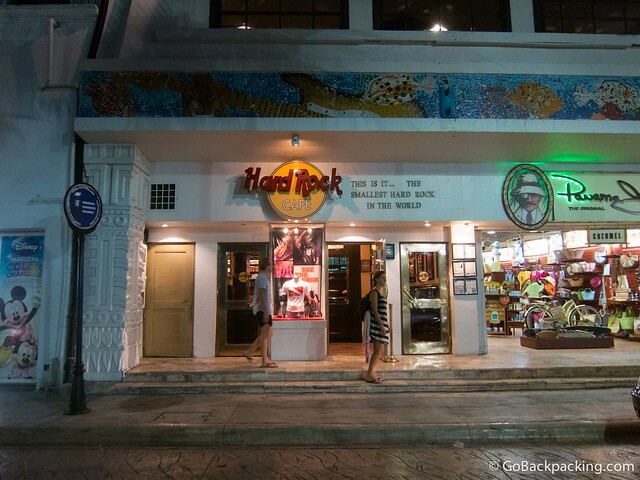 Last, but not least, we poked our noses inside Cozumel's very own Hard Rock Cafe, which is billed as the smallest Hard Rock in the world. The inside was decorated with the usual music memorabilia, including a white Fender Stratocaster signed by the Red Hot Chili Peppers, but it was by no means small. In retrospect, our day trip to Cozumel was a reflection of a relaxed approach toward doing things on Mexico's Riviera Maya. More ambitious visitors might be inclined to rent a car or scooter and drive around the entire island, visiting as many beaches and points of interest as possible. We were happy to take our time, and simply enjoy one. 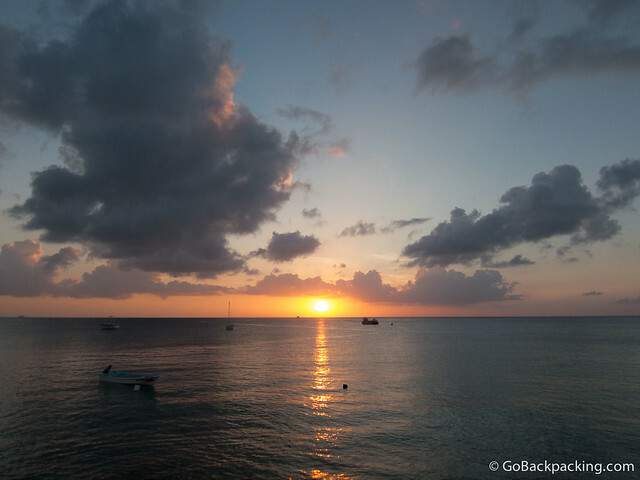 Great pictures and fabulous post.One of the things I’m most looking forward to when I visit Cozumel is catching the sunset. That sounds like my kinda day! Loved the photos and that Hard Rock really looks interesting!